Friday 6/5 – Listen live – 8 to 10 pm Eastern on Revolution Radio: http://www.freedomslips.com/ – click on the “Studio B” button. To be rebroadcast Sunday 11 a.m. to 12:45 p.m. Eastern on http://NoLiesRadio.org and then archived at the usual spot. Feeling harassed by Zionists? I am. I was just barred from speaking about my new book in Canada by the Zionist-run Harper regime, which is enacting a “zero tolerance” policy towards the pro-Palestine BDS movement. My earlier Midwest Book Tour drew an attack by the Anti-Defamation League. The ADL’s friends at The Jewish Chronicle ambushed Rabbi Michael Lerner for contributing to my book. (Lerner later called the JC’s attack article “slimy.”) And just today, my polite radio invitation to University of Michigan professor Victor Lieberman, a tireless anti-Palestine propagandist, was impolitely rebuffed. Meanwhile, over in Amsterdam, the Zionists are going ballistic over this weekend’s Open Mind Conference. They are waxing especially apoplectic about Christopher Bollyn, whose book Solving 9/11 pins the crime of the century squarely on the Zionist crime network and its Israeli enablers. The bad guys actually managed to get the conference booted out of its originally-scheduled venue, but the ensuing publicity is going to give the event far more attention than it otherwise would have received. So in honor of all this Zionist slander and censorship, I’m going to push right back even harder with two guests who do not mince words. First hour: Paul Topete of the leading freedom rock group Poker Face is a notoriously uninhibited truth-teller. Paul calls it exactly the way he sees it – and what he sees isn’t always pretty. While I may not agree with everything he says, I will defend to the death his right to say it. 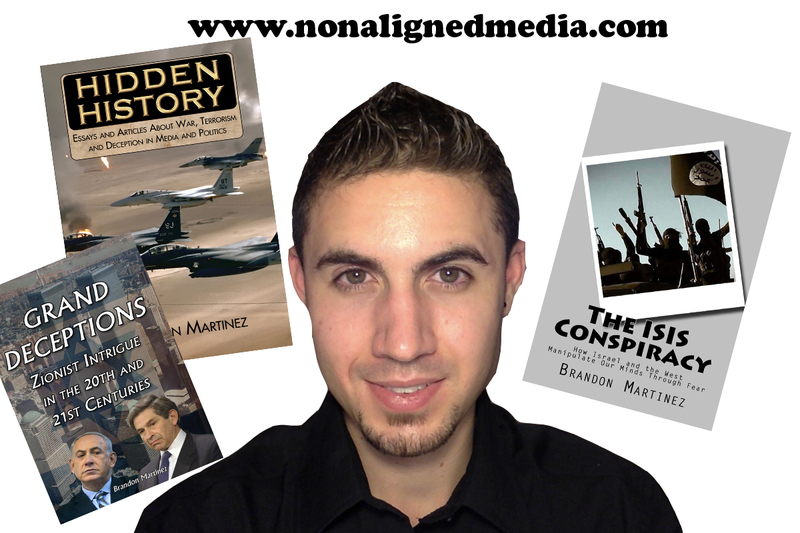 Second hour: Brandon Martinez, like Paul Topete, is one of the most outspoken and eloquent anti-Zionists in North America. And like Paul, Brandon thinks the evils of Zionism have their roots in problems endemic to organized Jewry. (That’s pretty much what Gilad Atzmon has been saying for years.) Are these guys right? Partly right? Or does this line of inquiry lead to dangerous bigotry? Tune in and decide for yourself.